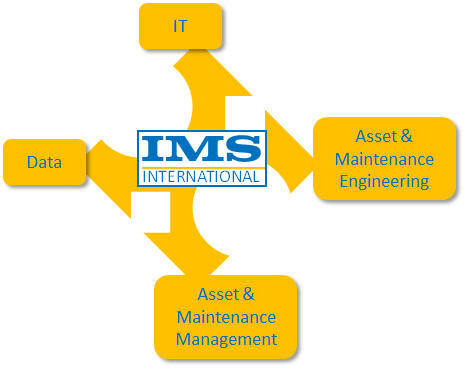 IMS International provides international customers with Integrated Maintenance Management Solutions. Our solutions enable customers to reduce maintenance costs, improve asset availability and achieve operational excellence. Our solutions are used in various industrial sectors like process industry, oil & gas, aerospace, water management, food & beverage, transport, energy, infrastructure, maritime, leisure, etc. Our integrated approach, combining advanced maintenance management methodologies, RAMSHEC analyses (reliability, availability, maintainability, safety, health, environment and cost) and communications technologies, support maintenance managers and staff to achieve best performance against lowest costs.